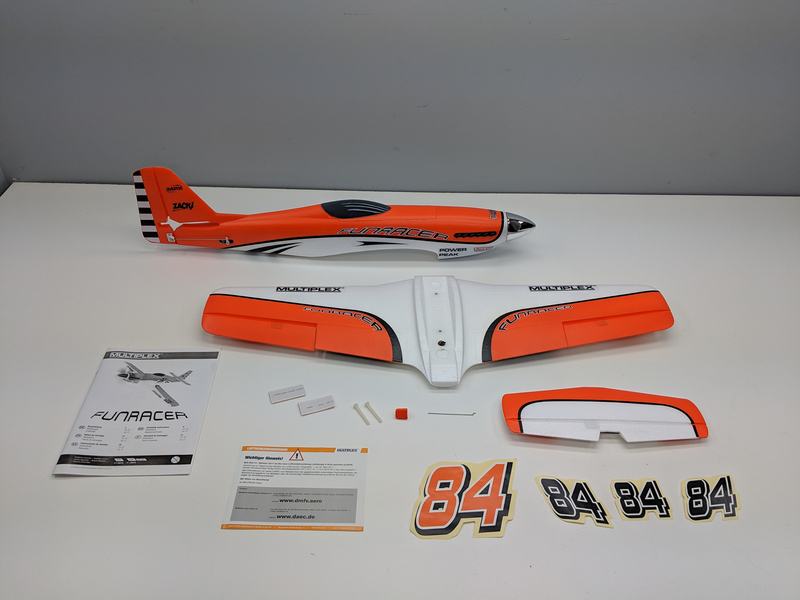 This is how Hitec describes the new FunRacer Receiver Ready aircraft. 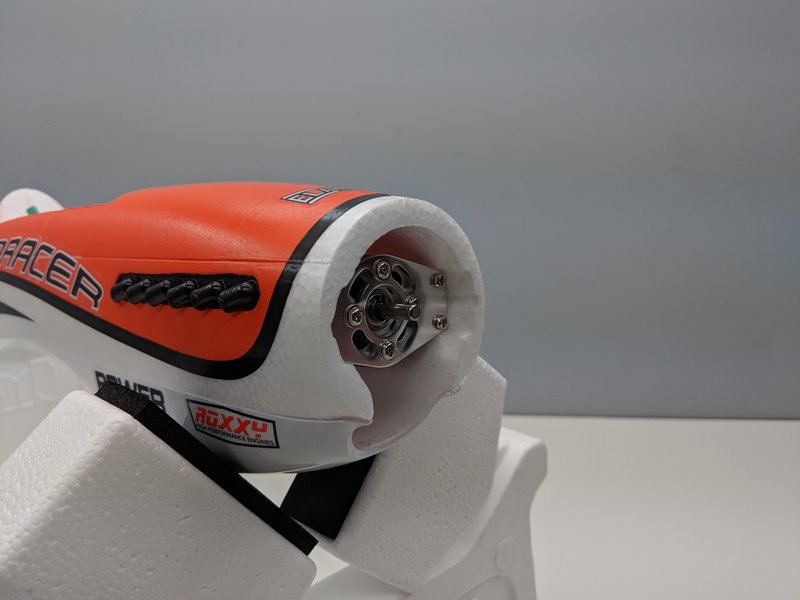 Based on its sporty, sleek looks alone, I’m guessing that it’ll live up to Hitec’s description! 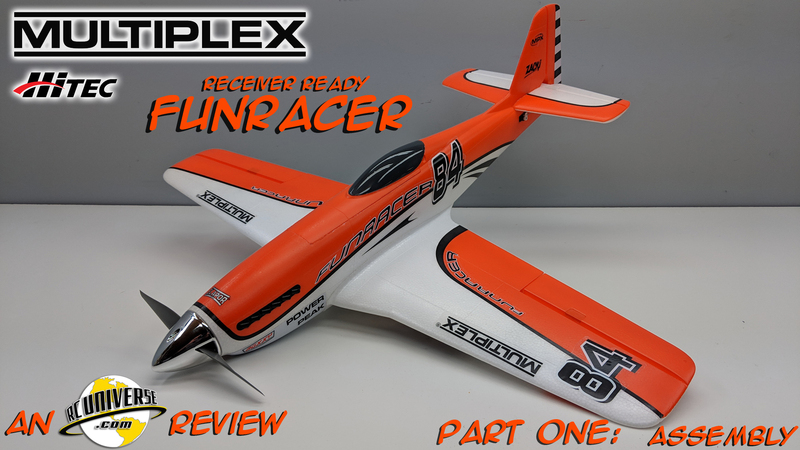 So, while I wait for the Minnesota winter to retreat, I’ll get part one of this review in the books. 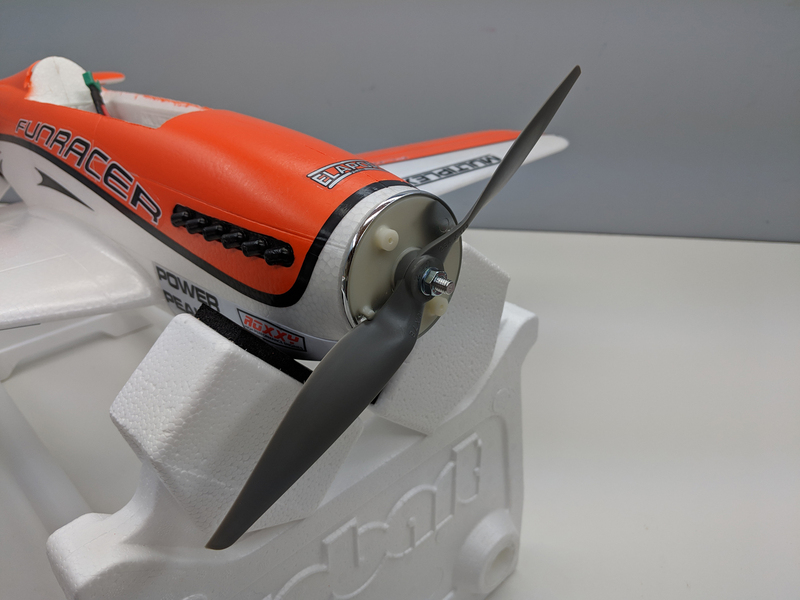 We’ll dive into what’s in the box, and what it takes to get it ready to fly. Interested? 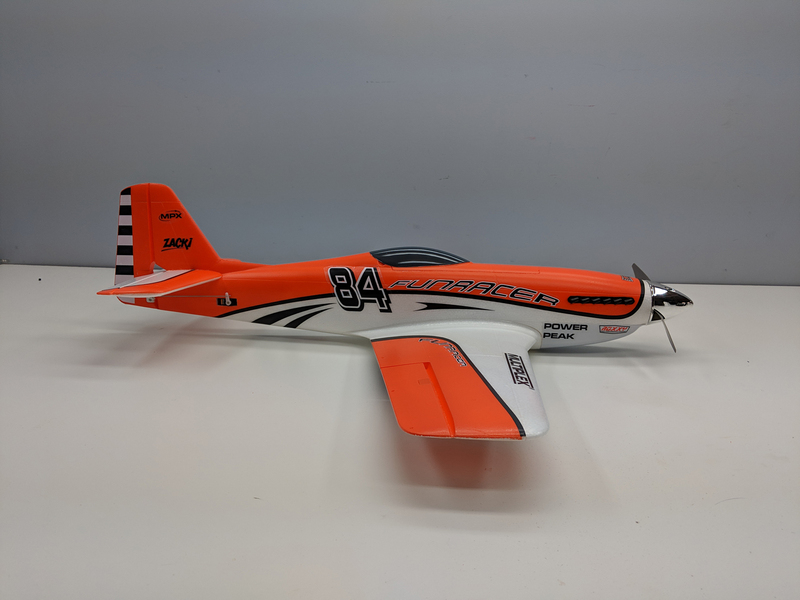 Read on to see how quickly this one can be ready for airtime! 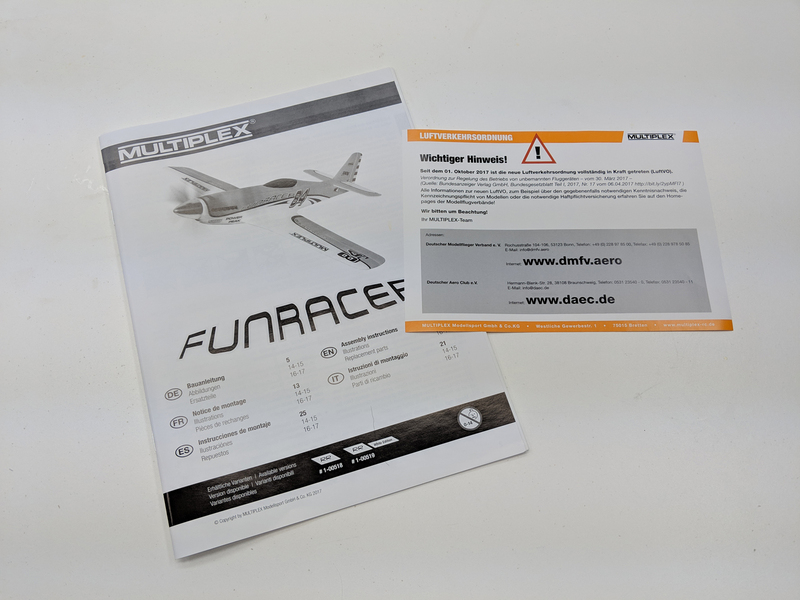 The FunRacer arrived in a full color box adorned with lots of images, product specifications, and a required items list. 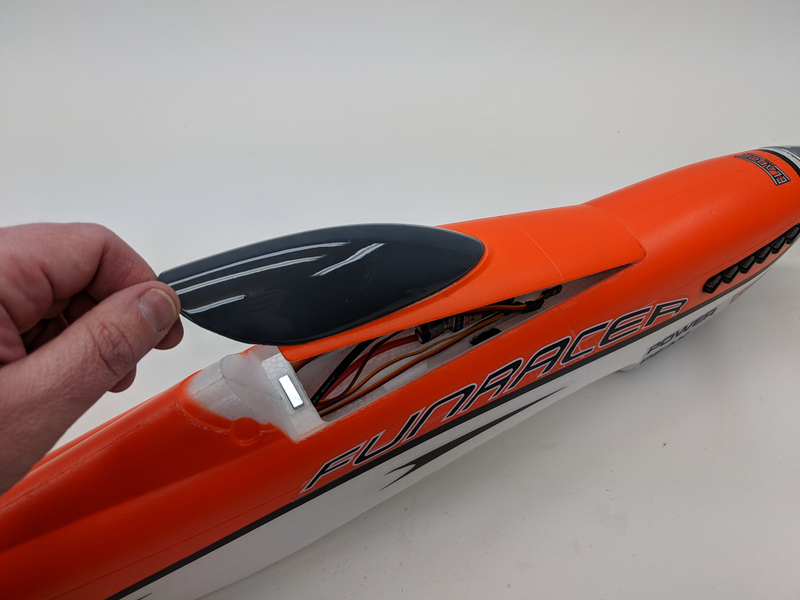 When I removed the top half of the box, I found that the bottom had special cradles glued in place to keep the FunRacer protected during shipping. 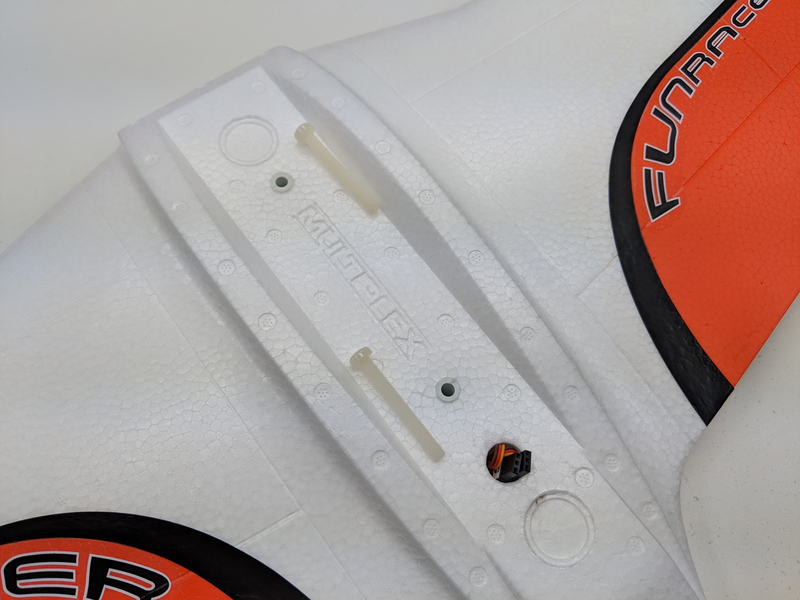 In addition to the foam cradles, the parts were also wrapped in bubble wrap. 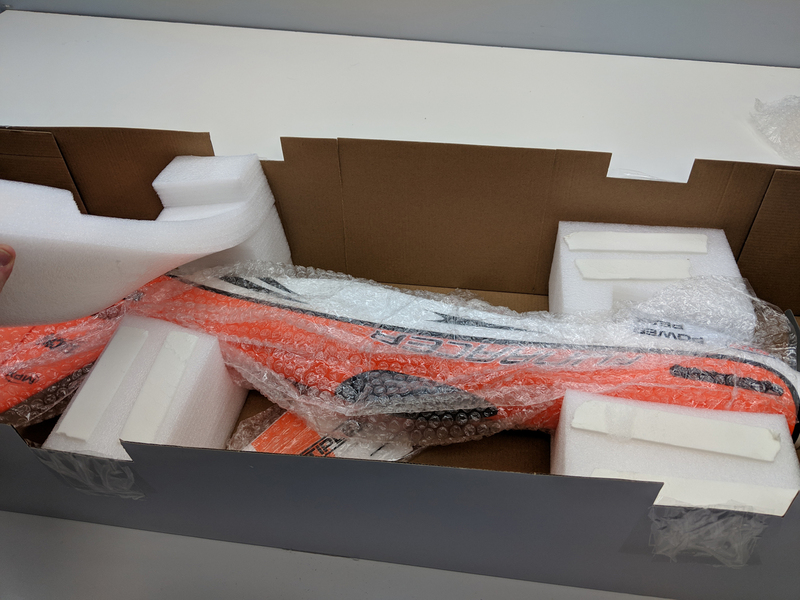 The shippers could have nearly destroyed the box, and its contents would have stayed unscathed! 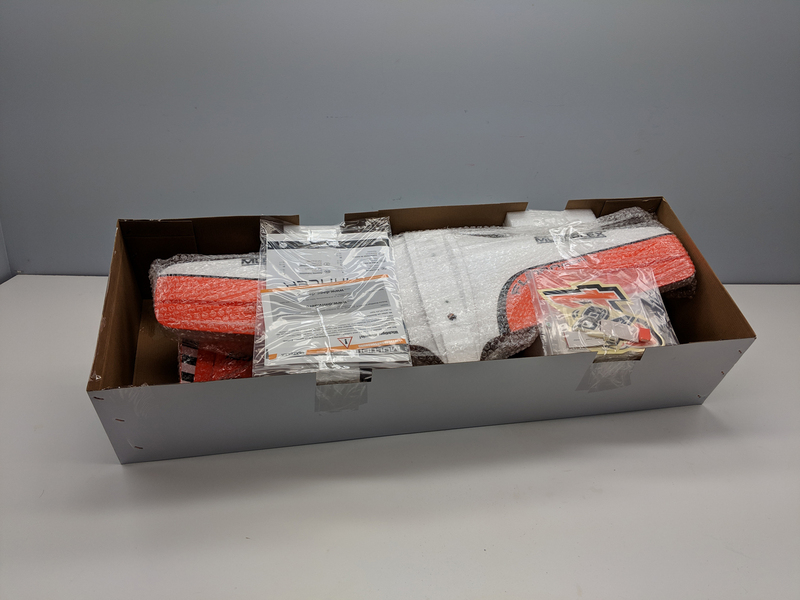 The parts were inspected and laid out for inventory purposes. 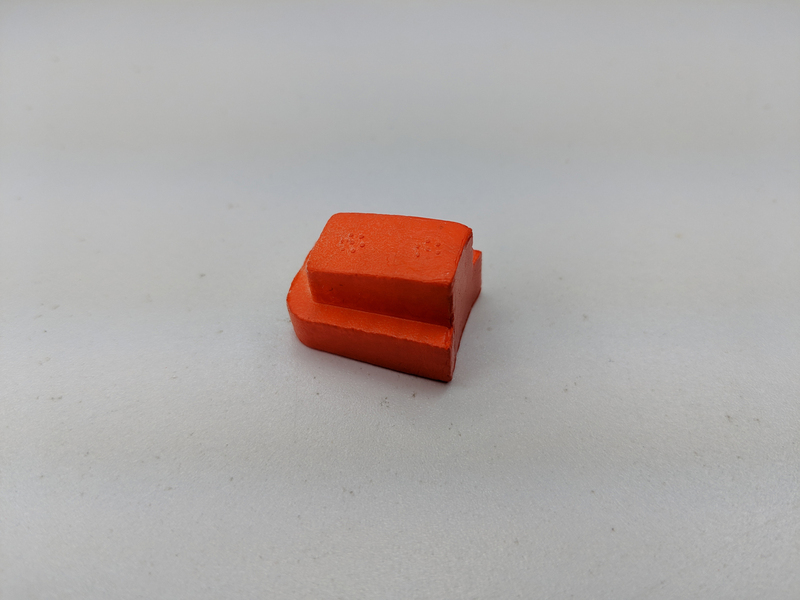 All parts were present, and the parts count is very low. 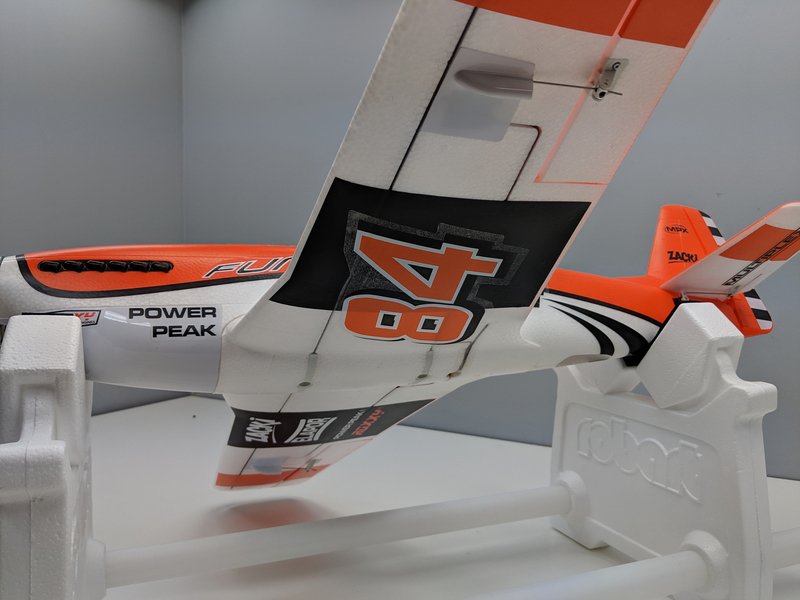 Most of the work is completed at the factory, leaving very little for the modeler to do to get the FunRacer in the air! 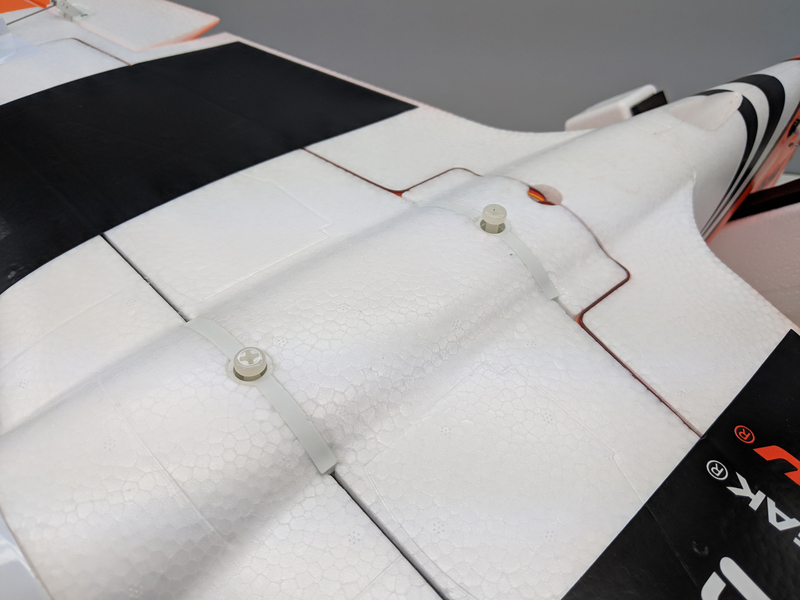 A one-piece wing is completely ready to attach to the fuselage. 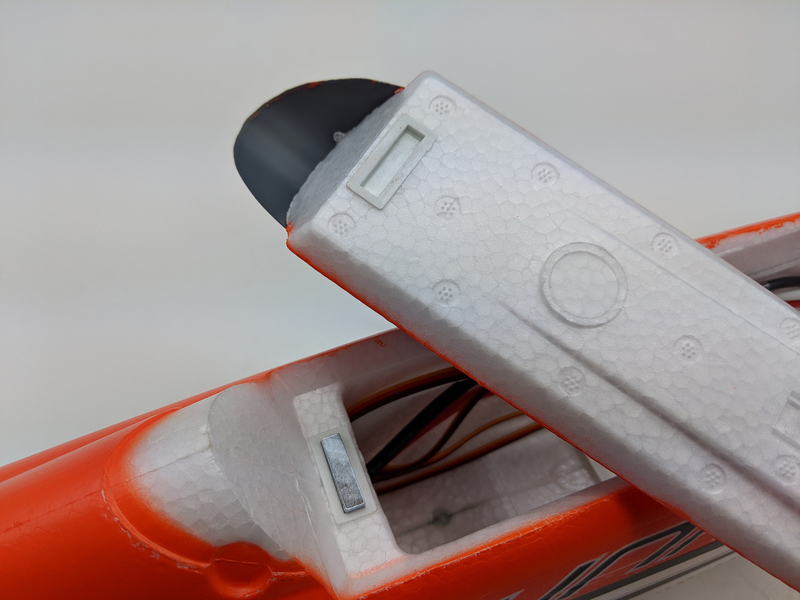 The metal geared servos are pre-installed, as are the servo arm protectors. 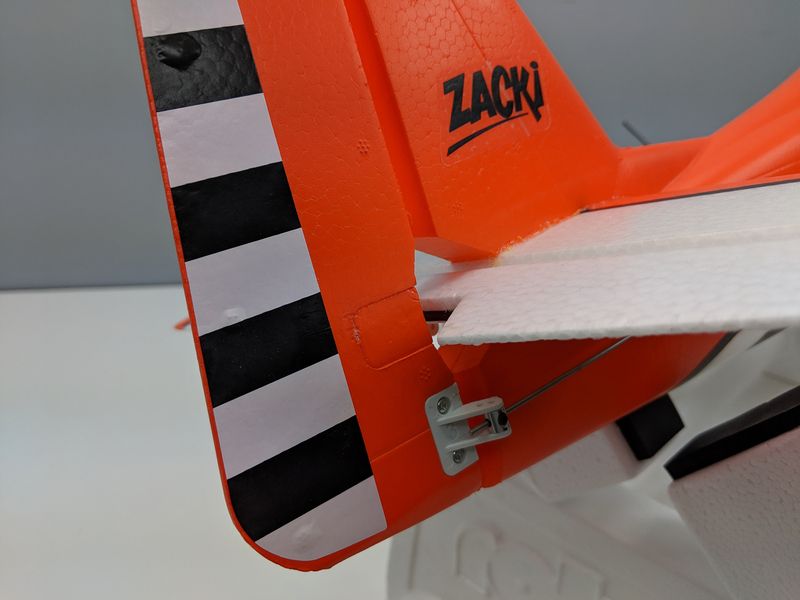 Even the pushrods were attached to the pre-installed aileron control horns! 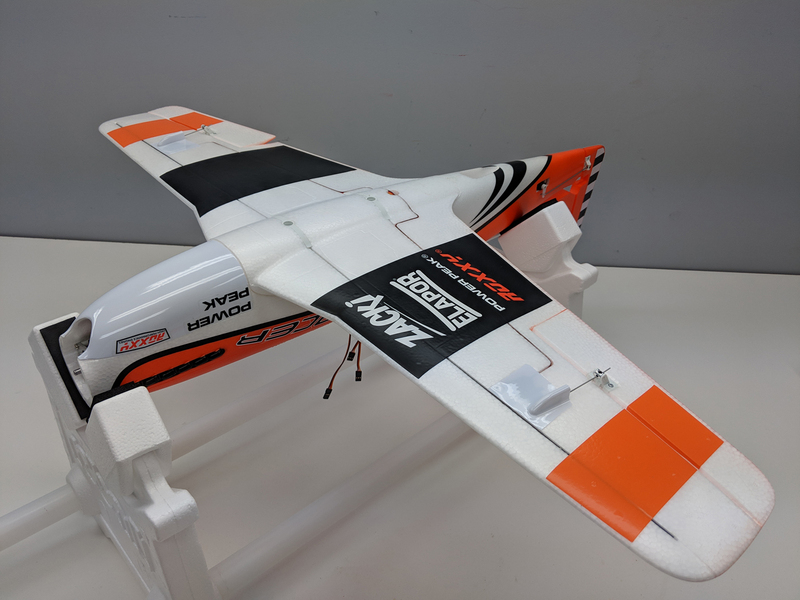 The pre-painted airframe is almost completely pre-assembled, and most of the decals are also pre-applied. 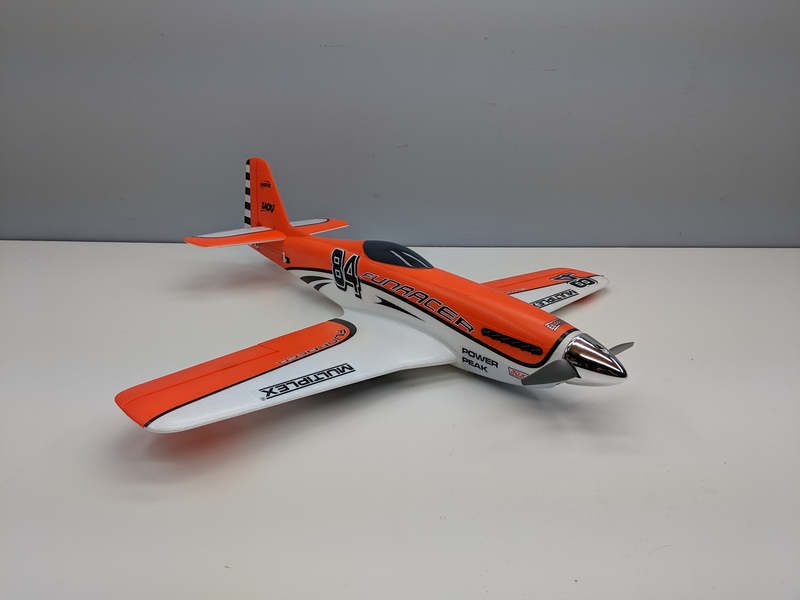 The large, chromed plastic spinner looks great, and the white plastic air intake should do well to protect the plane during belly landings. 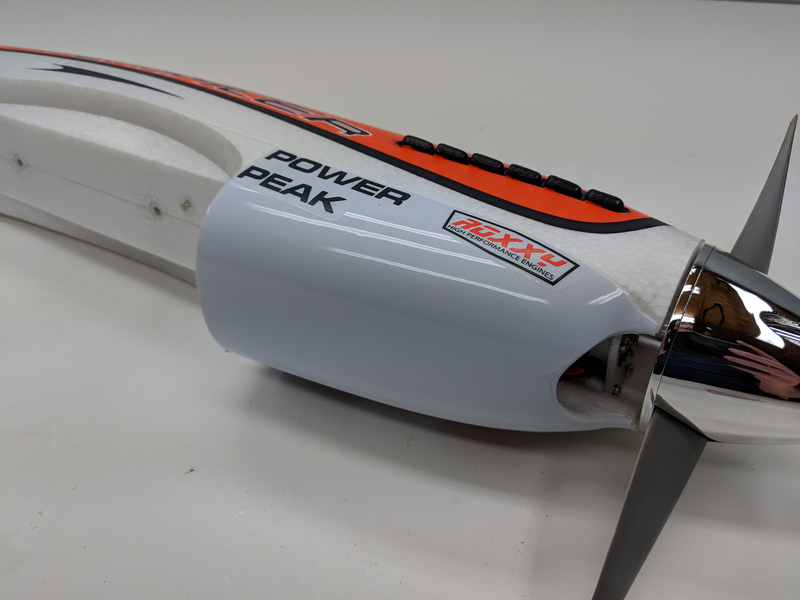 Looking into the airscoop, you can catch a glimpse of the ROXXY C35-42-1160 kV brushless outrunner motor, which should provide plenty of pull with the included 10″x7″ nylon electric propeller. 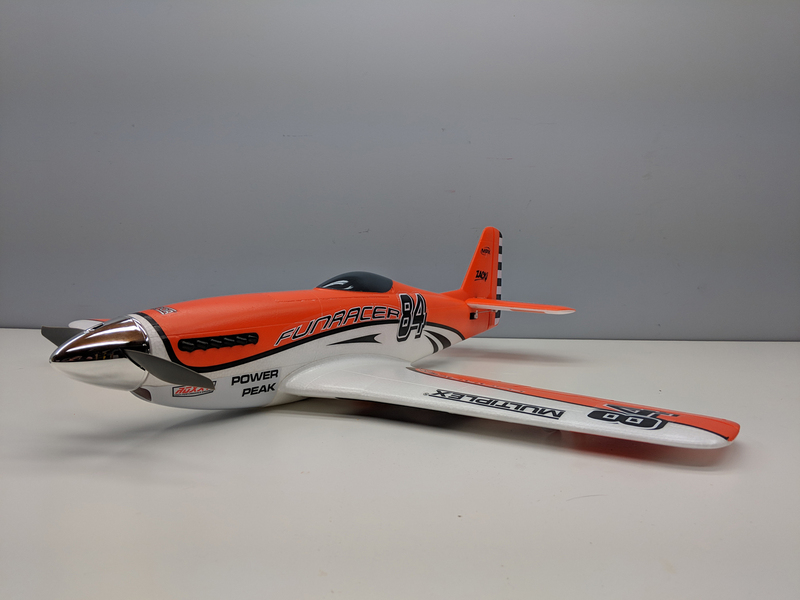 The simulated exhaust stacks and sleek canopy are a nice touch, adding enough detail to the overall airframe to help it resemble a modified Reno racing P-51 Mustang . 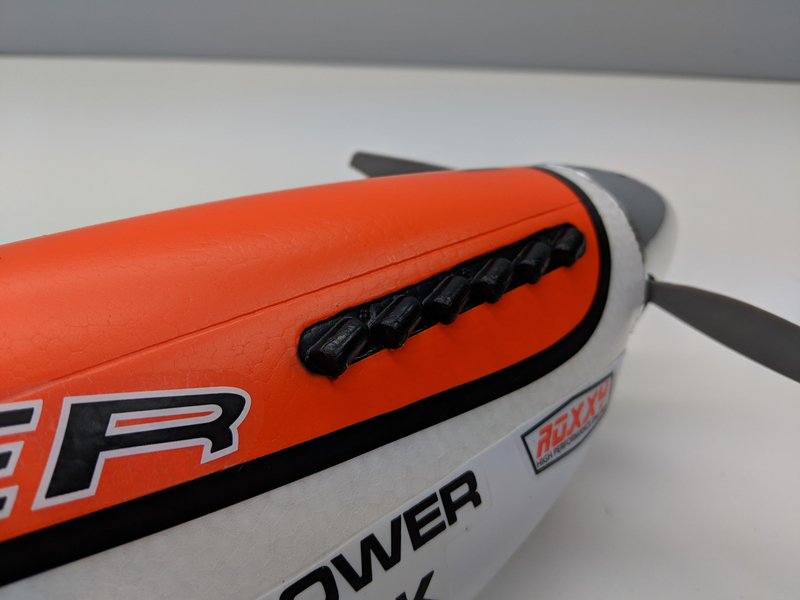 Speaking of the canopy, it’s attached to the battery hatch. When I tried to remove the hatch for the first time, the magnet on the hatch separated from the hatch. 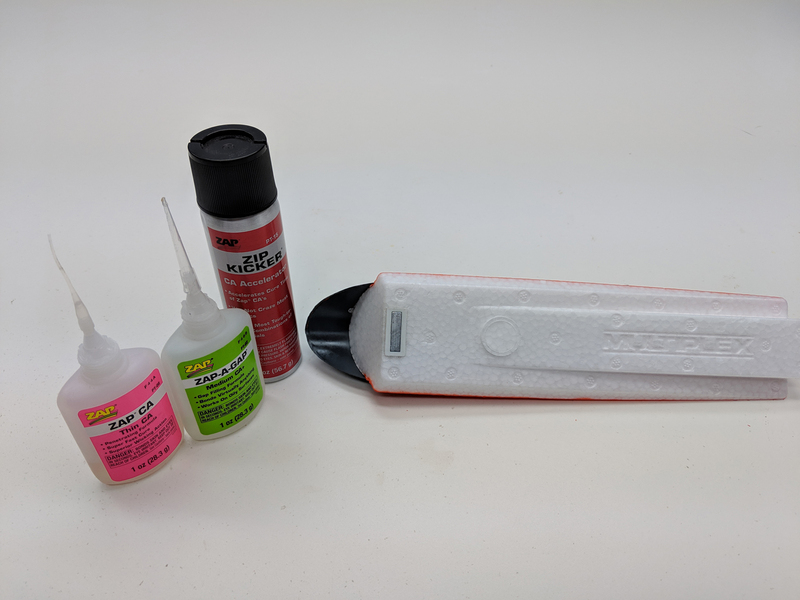 Apparently, it required a little more glue that what was applied at the factory. 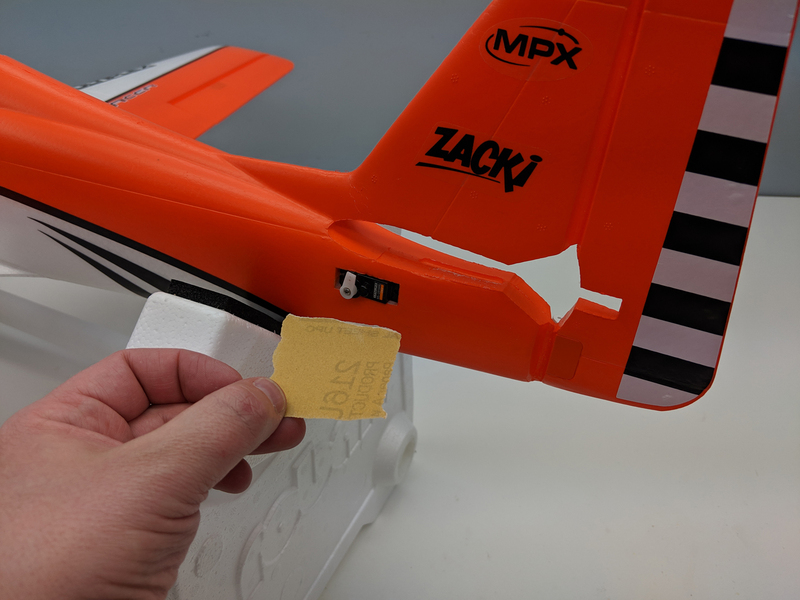 This was not an issue to repair – I applied a couple of drops of ZAP-A-GAP Medium CA+ to the magnet mount, and sprayed a little ZIP Kicker on the magnet, before inserting the magnet into the mount. 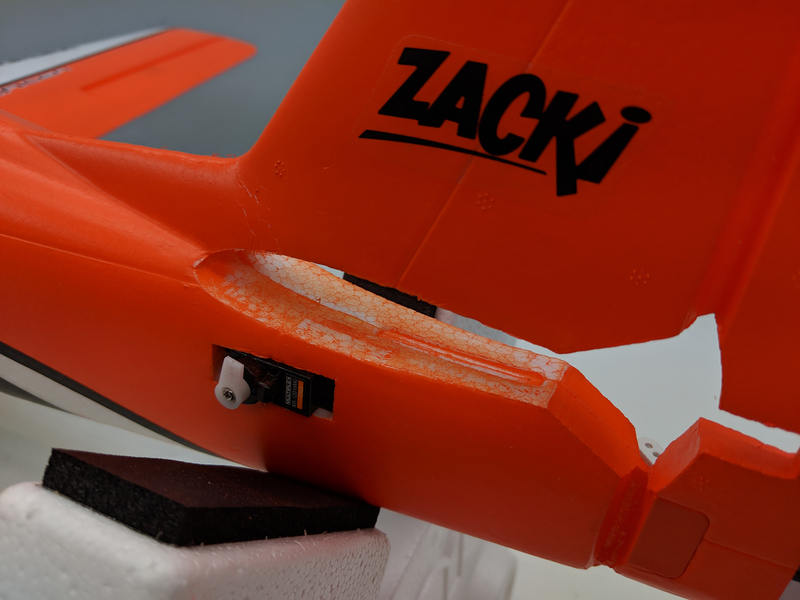 Once the Medium CA had cured, I added a few drops of ZAP Thin CA to the edges of the magnet. The magnet will surely stay in place now! 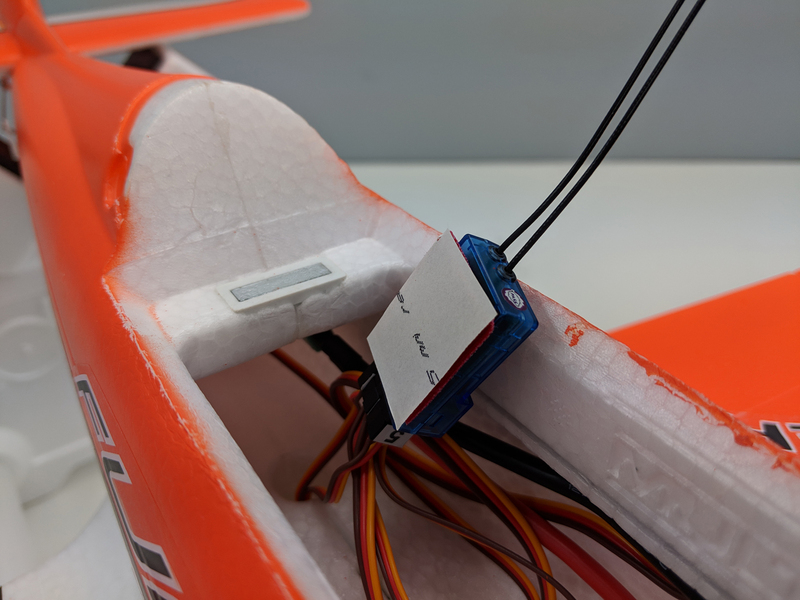 A ROXXY 755 S-BEC 55 Amp ESC is pre-installed in the fuselage, and is wired for the green Multiplex battery connector. 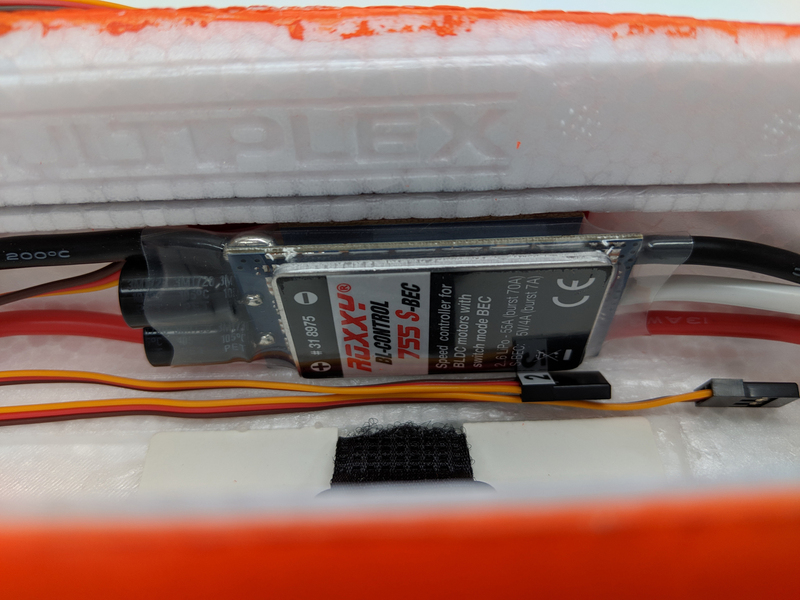 No worries here, as I found these connectors on Amazon.com for a reasonable price, and mad a battery adapter for my LiPo’s Deans Connector. 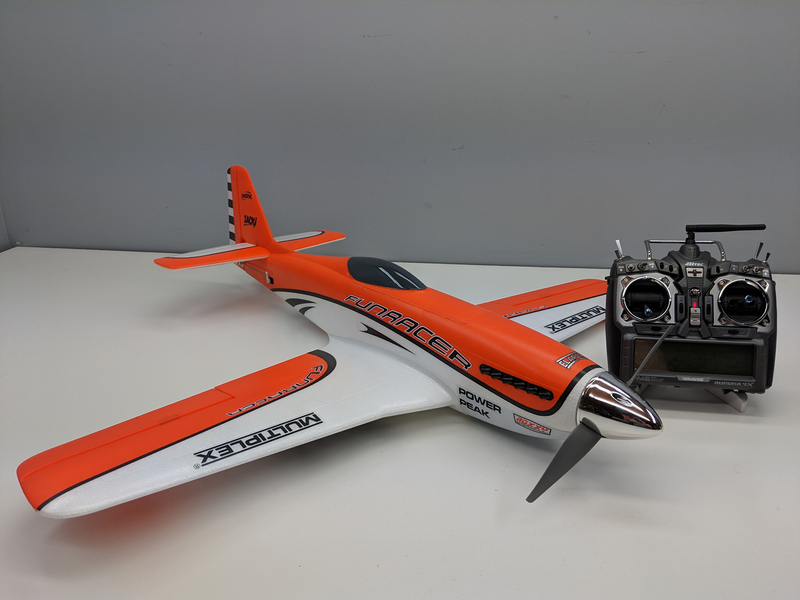 The Multiplex MS-12016MG servos are digital and incorporate a metal gear train. 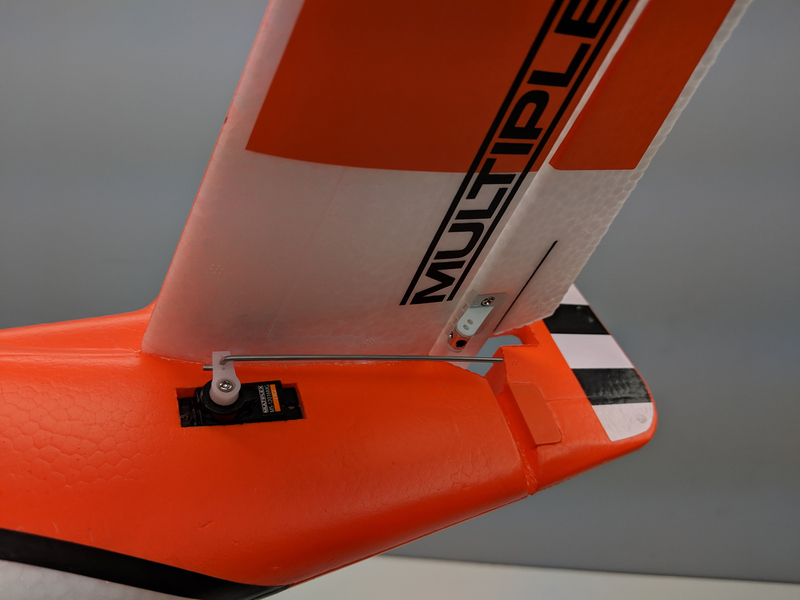 Like the ailerons, the rudder servo and pushrod are pre-installed! 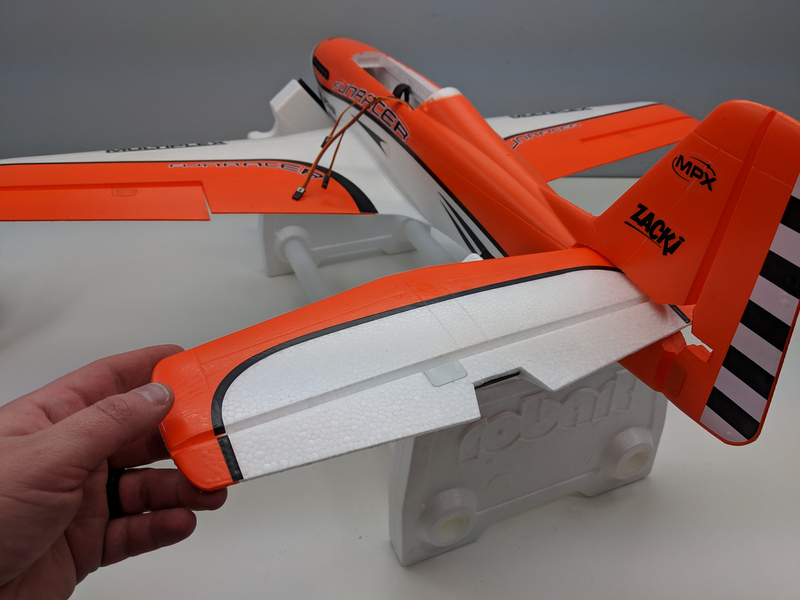 The horizontal stabilizer/elevator assembly needs to be installed, and is glued in place. 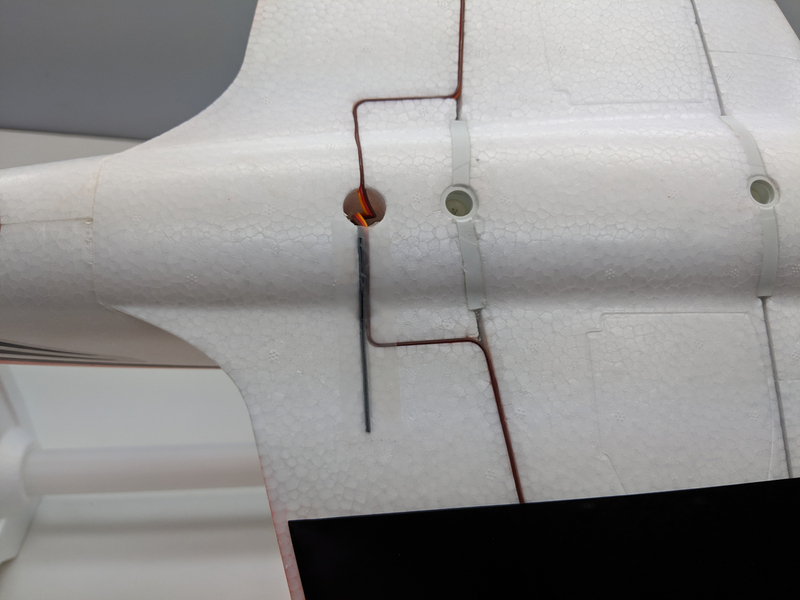 There’s a ‘plug’ that is also installed in the rudder to close the gap required for the stab/elevator to slide in place. I found this to be a nice touch! 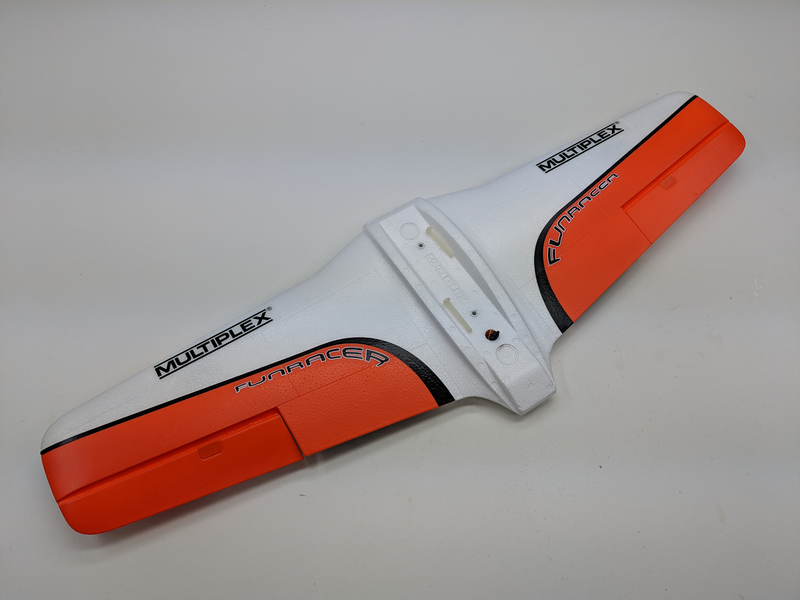 Because the Multiplex FunRacer is Receiver Ready, most of the work is already done for the modeler. 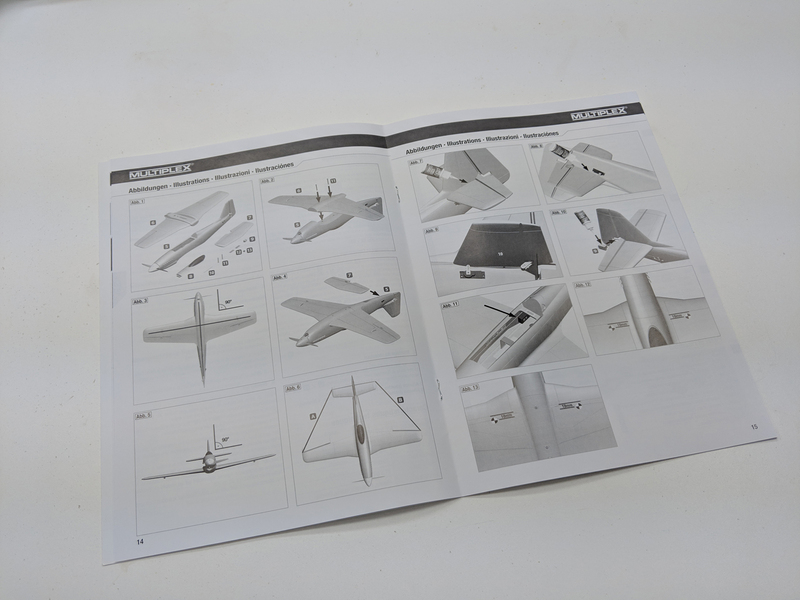 However, final assembly is still required, and therefore, a manual is supplied. 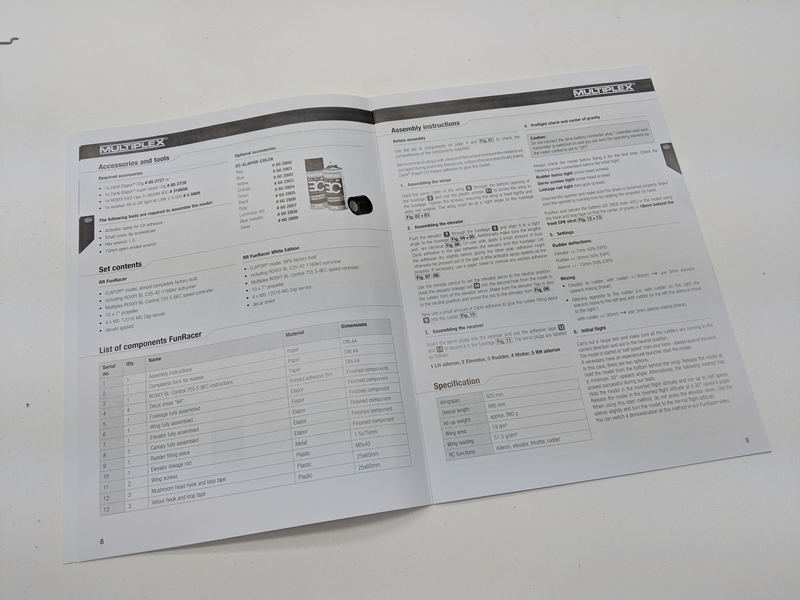 The manual is comprised of a few written instructions (printed in five languages), and the middle pages are assembly illustrations. The written part is clear and concise, and the illustrations are well done. 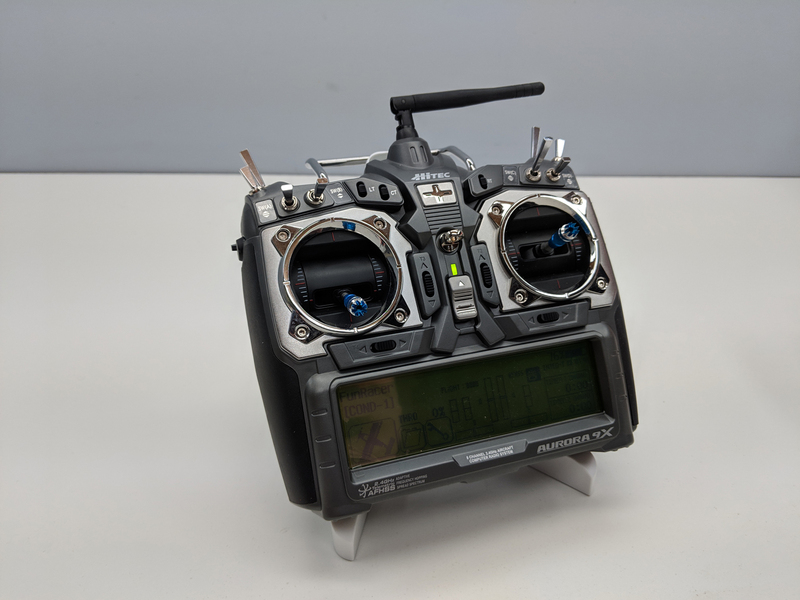 In addition to a 3-4S LiPo Battery and charger, you will need a 4-5 Channel transmitter and receiver. 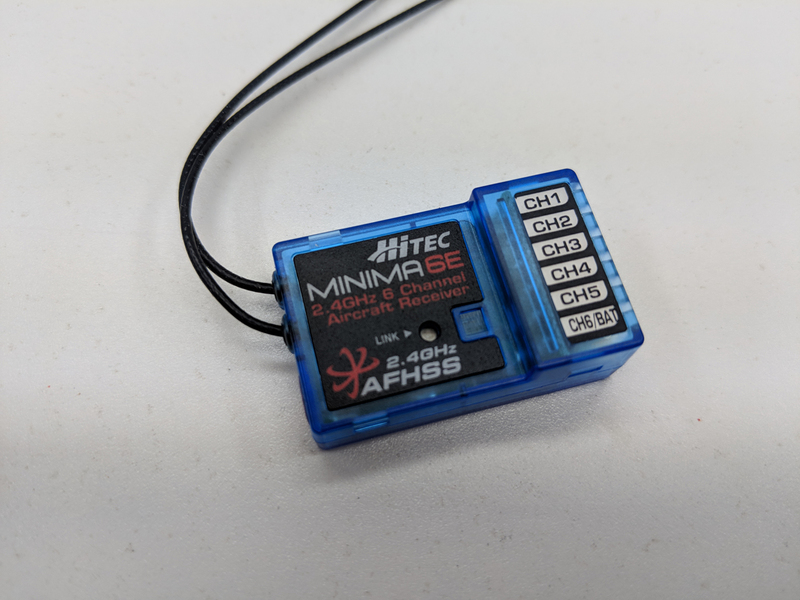 I will be using my Hitec Aurora 9X transmitter and a Hitec Minima 6E receiver. 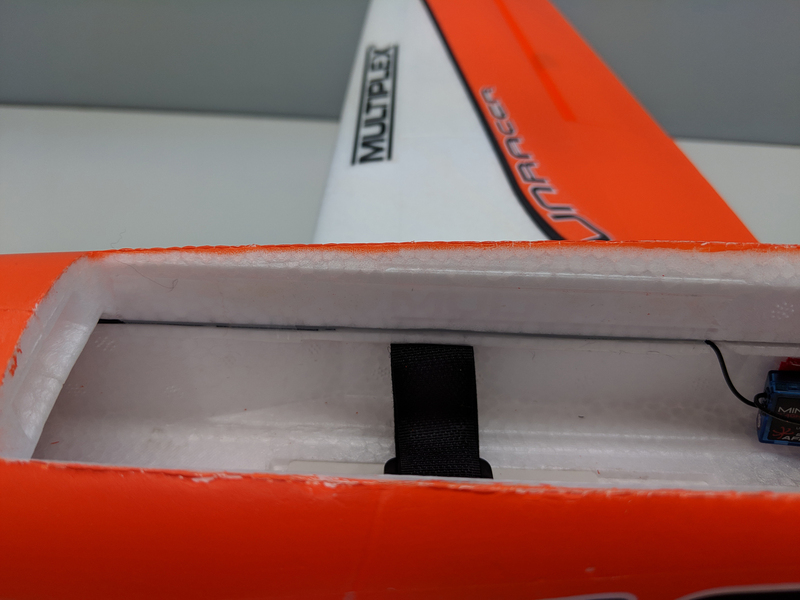 This will allow me to separate the ailerons to individual channels for easy setup. 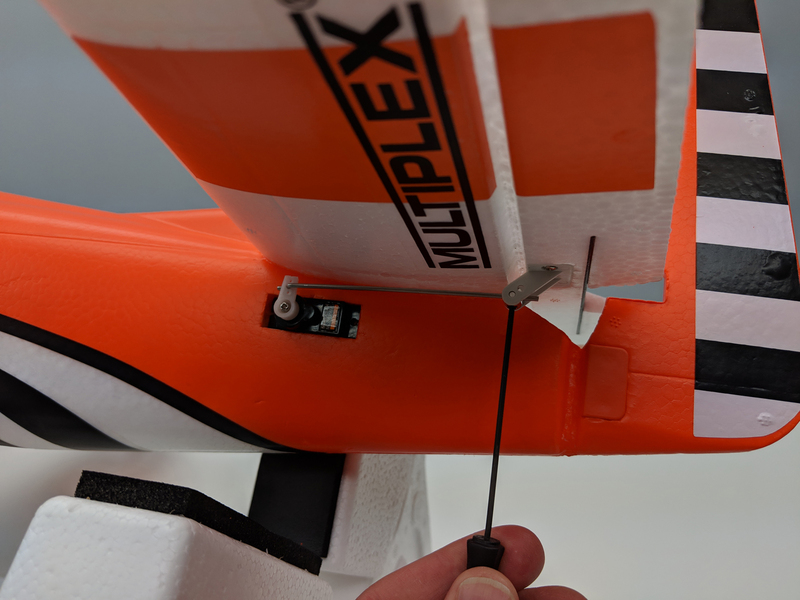 The End Port connection on the Minima 6E will make installation and connecting the servo wires really easy! 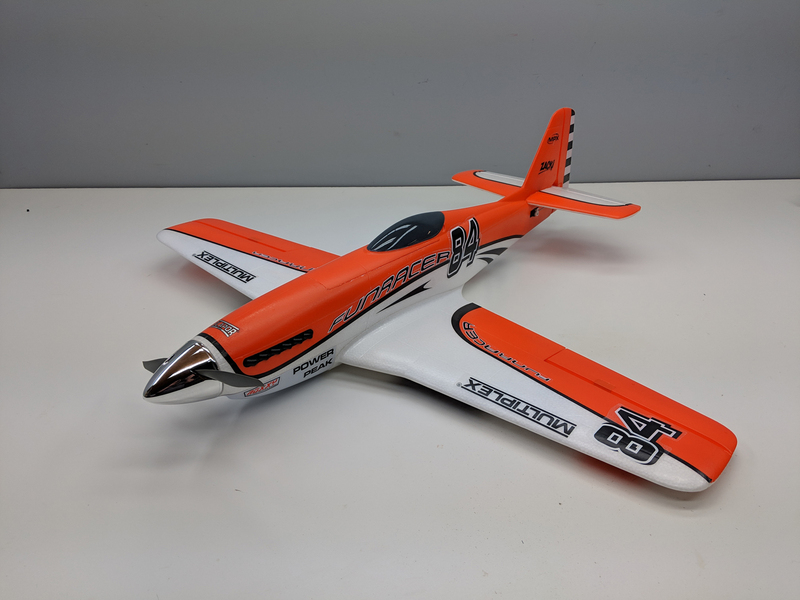 Before we begin assembly, I want to add one more item of interest. 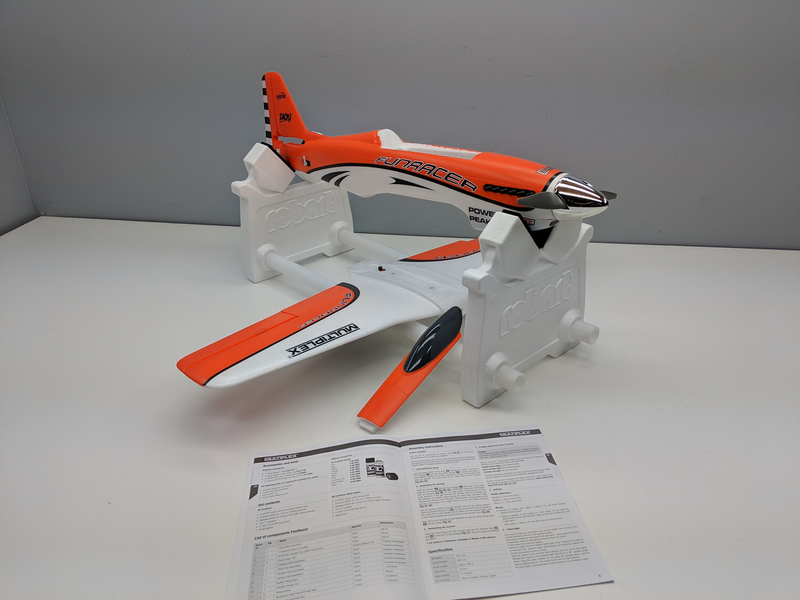 A padded building/assembly stand was of great help while assembling the FunRacer, and the Robart Super Stand II is a great choice. Sure, you can get by without the Super Stand II, but why would you want to? 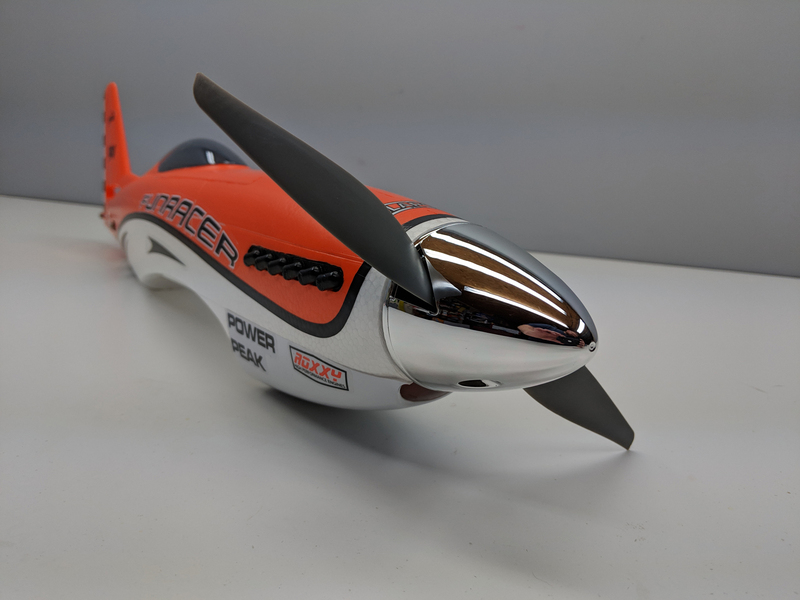 Because the FunRacer is pretty much ready to fly right out of the box, I removed the propeller and spinner during the assembly process. 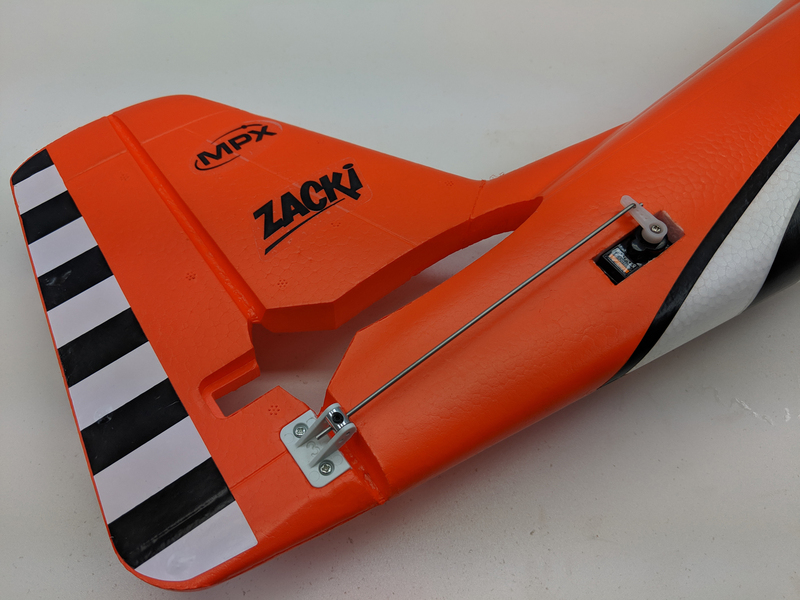 These nylon, thin, electric props can be as sharp as a knife, and all it takes is a second of not paying attention to get hurt. 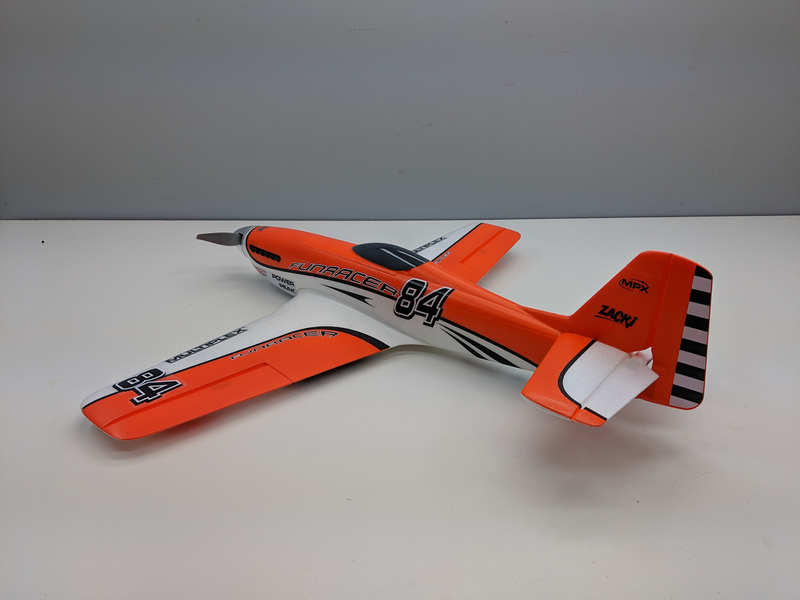 Propellers off save fingers! 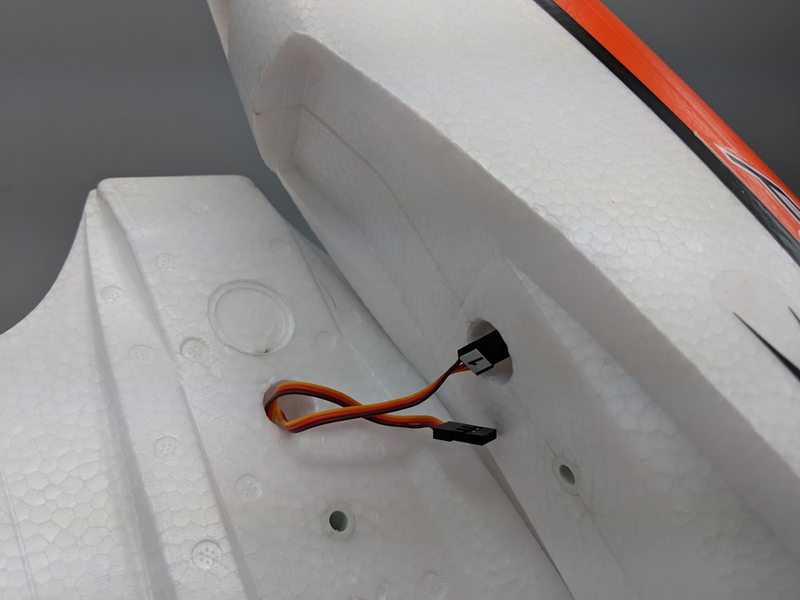 I pulled the aileron servo wires out of the hole in the wing, and pushed them through the hole in the fuselage to start the assembly process. 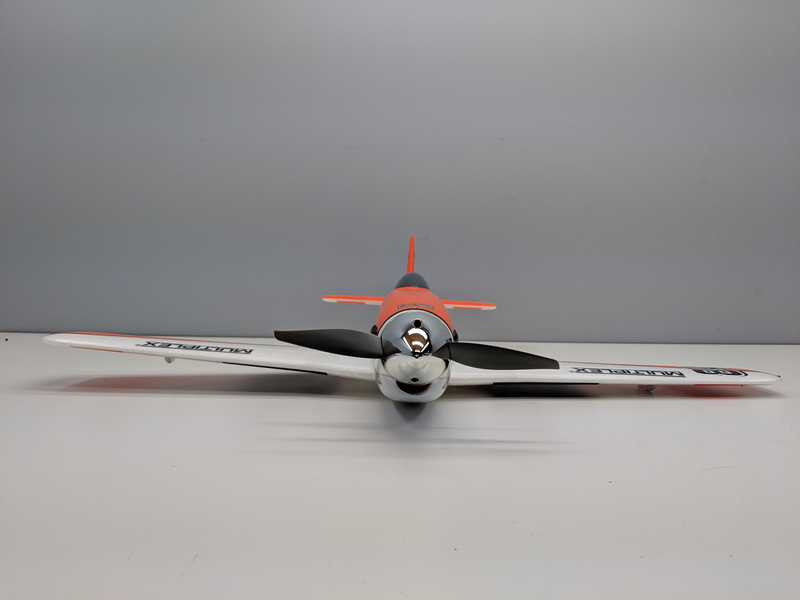 Setting the wing in place on the fuselage was easy with the fuselage inverted in the Super Stand II. 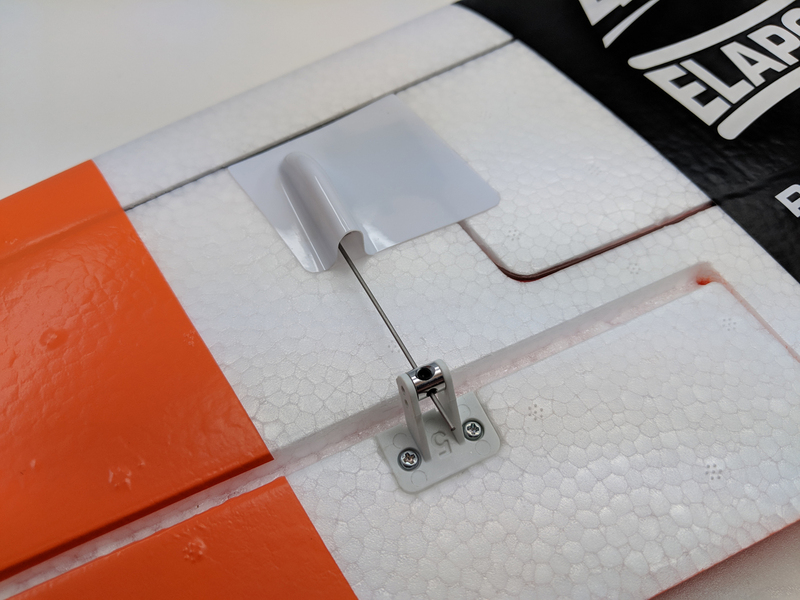 A pair of nylon wing bolts secured the wing to the fuse. 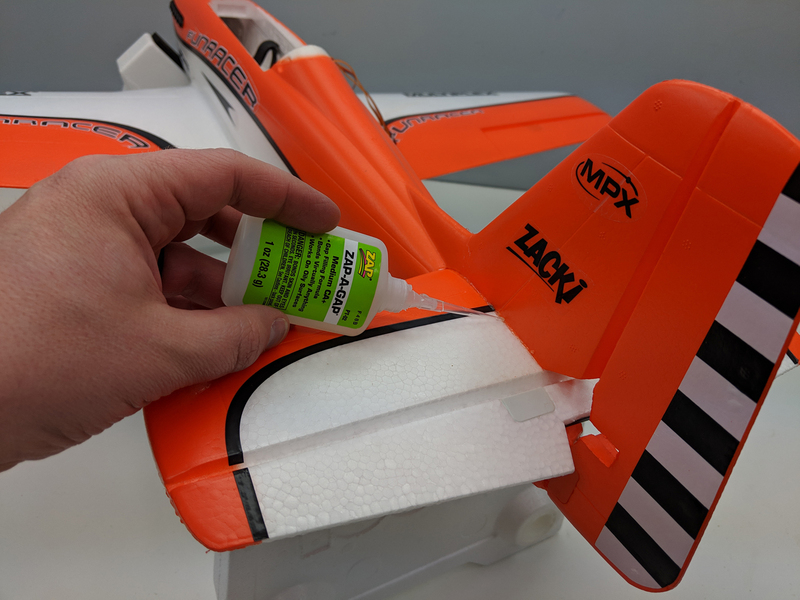 Though not mentioned in the manual, I decided to remove the orange paint in the horizontal stabilizer mount to promote better glue adhesion. After sanding the paint off, I used a rag and denatured alcohol to make sure the mount was clean. The stabilizer was slid into position and checked for alignment. When it was properly located, I lightly traced an outline onto the stab with a pencil. 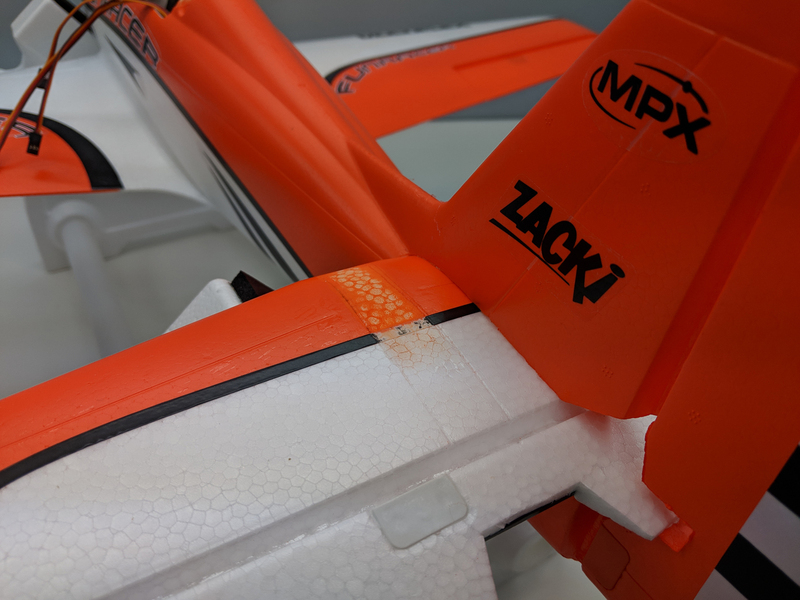 Like the mount, I removed the orange paint from the stabilizer. 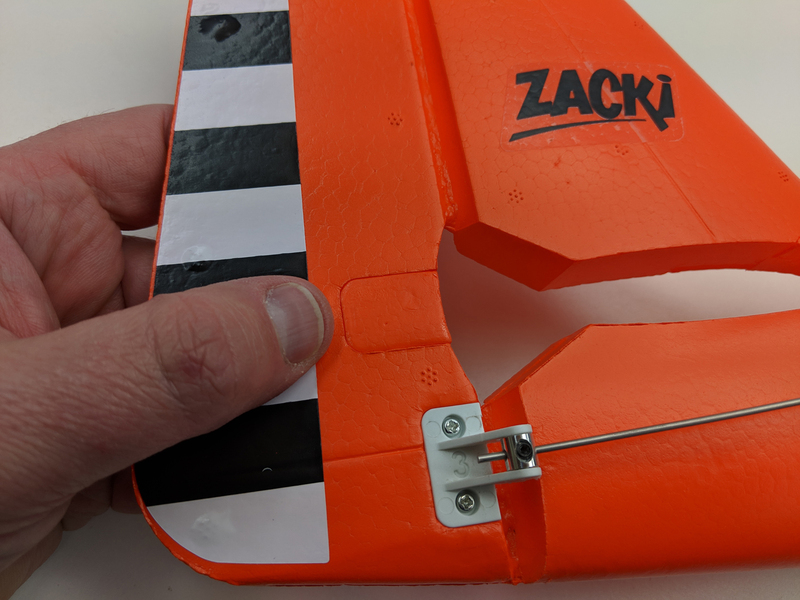 The manual calls for Zacki CA, but I used ZAP-A-GAP Medium CA+ and ZIP Kicker instead. 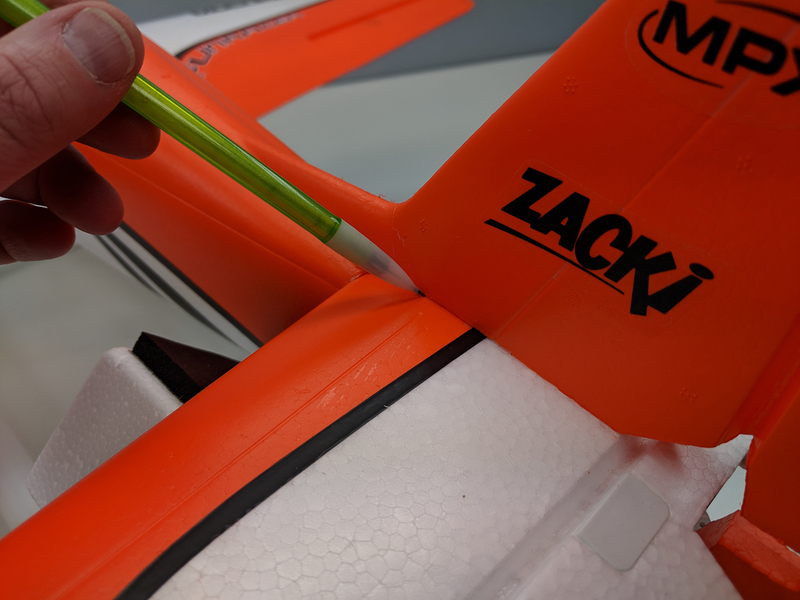 The ZAP CA did a fine job of gluing the Stabilizer in place, and the joint felt very solid once the CA had cured. 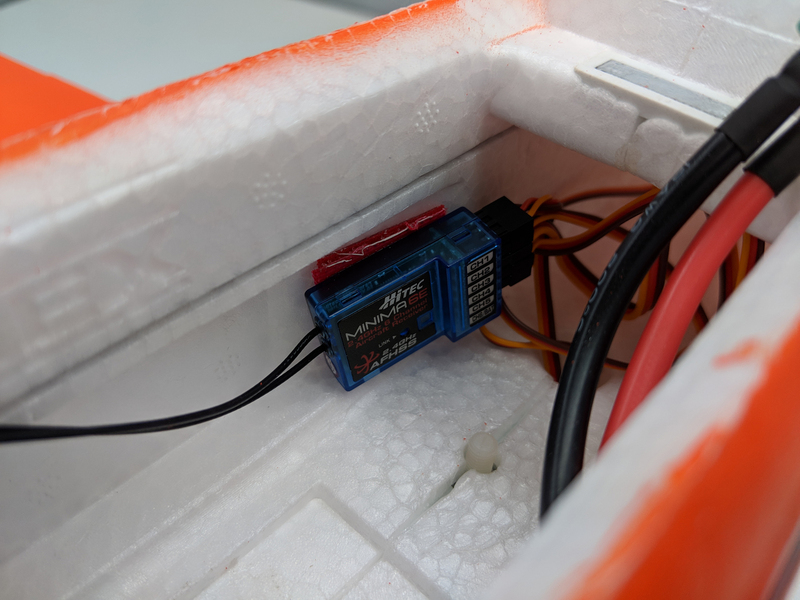 I installed the elevator pushrod after centering the servo and control surface. 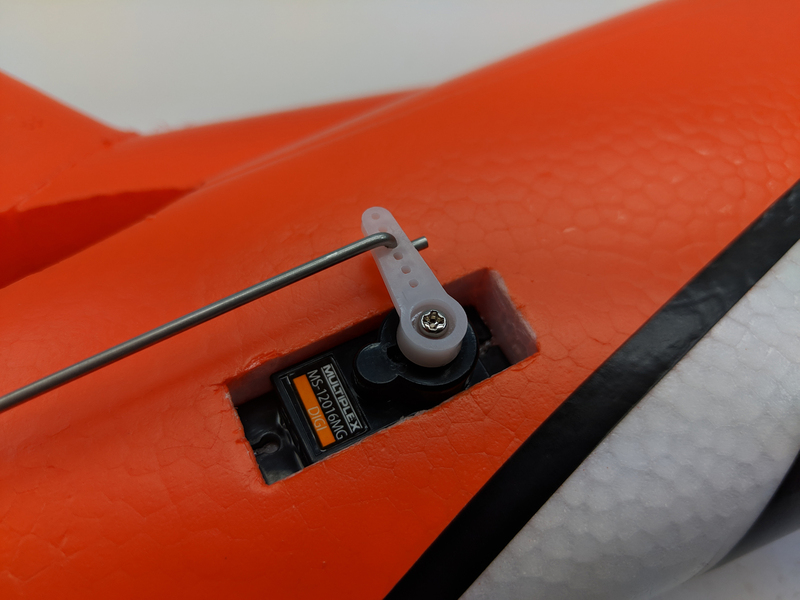 A drop of ZAP Z-42 Blue Thread Locker was applied to the set screw before it was tightened against the pushrod. 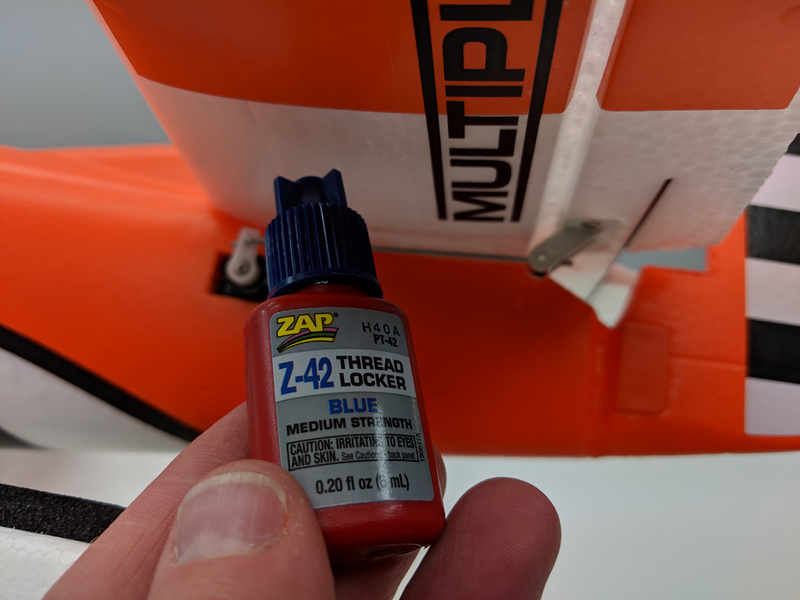 The thread locker was also applied to the set screw on the rudder. 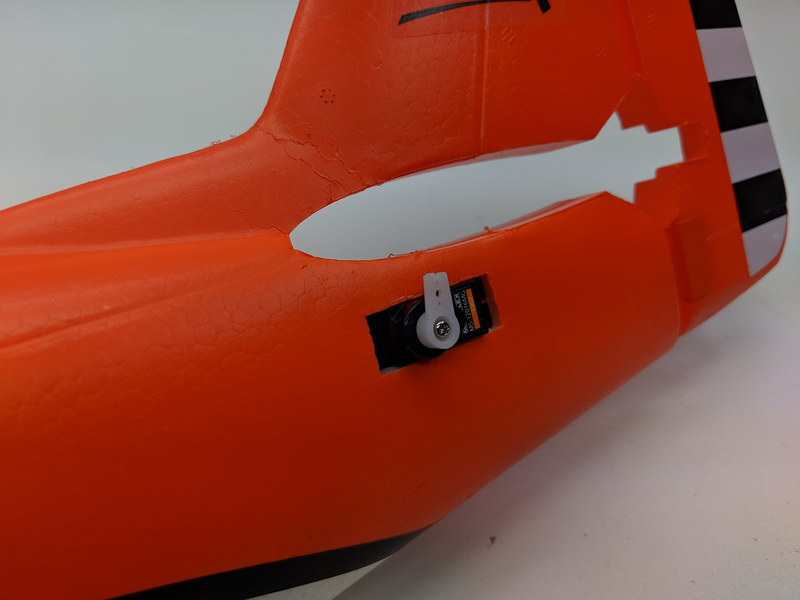 The rudder plug was glued in place using ZAP-A-GAP Medium CA+ and ZIP Kicker, and the Hitec Minima 6E receiver was secured to the inside of the fuselage using the included adhesive-backed hook’n’loop tape. 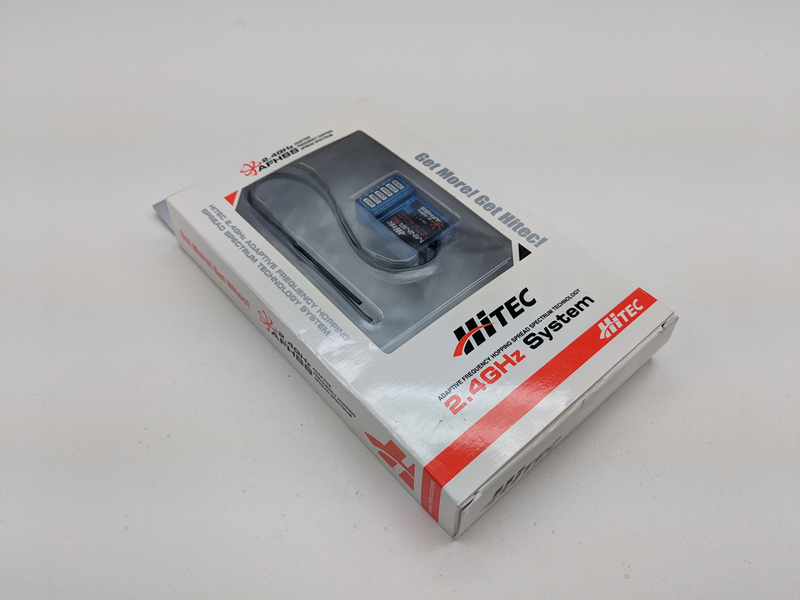 Because the Hitec Minima 6E has dual antennas, They need to be mounted at 90° angles to one another. 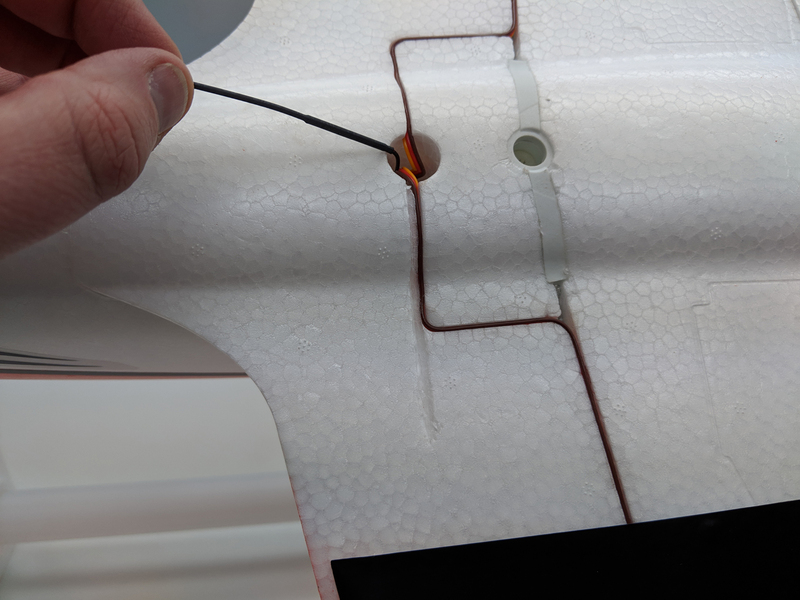 An antenna channel is molded into the inside of the fuselage for one of the antennas, but the other one needed a little help. 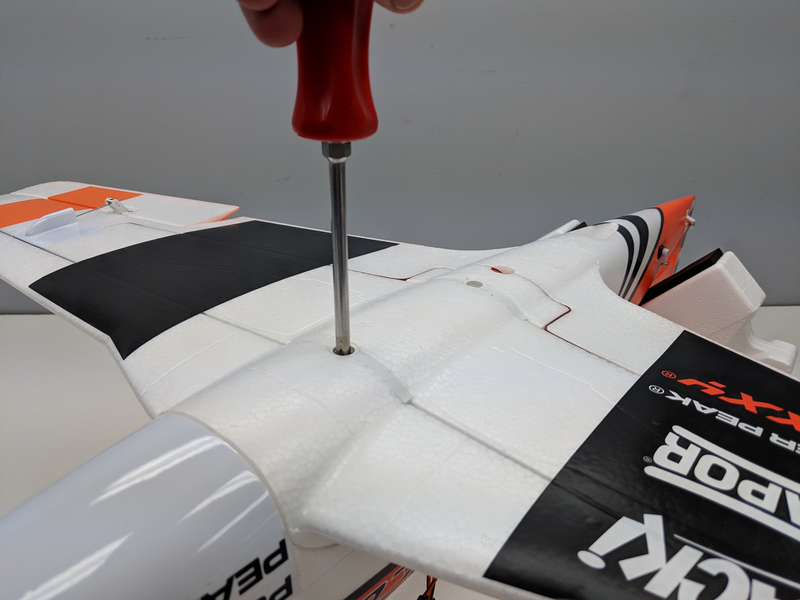 I decided to run the antenna out the bottom of the wing, cut a shallow groove in the bottom of the wing, and tape the second antenna in the groove. Not only does this keep the antennas at the proper angles, it keeps them both protected. 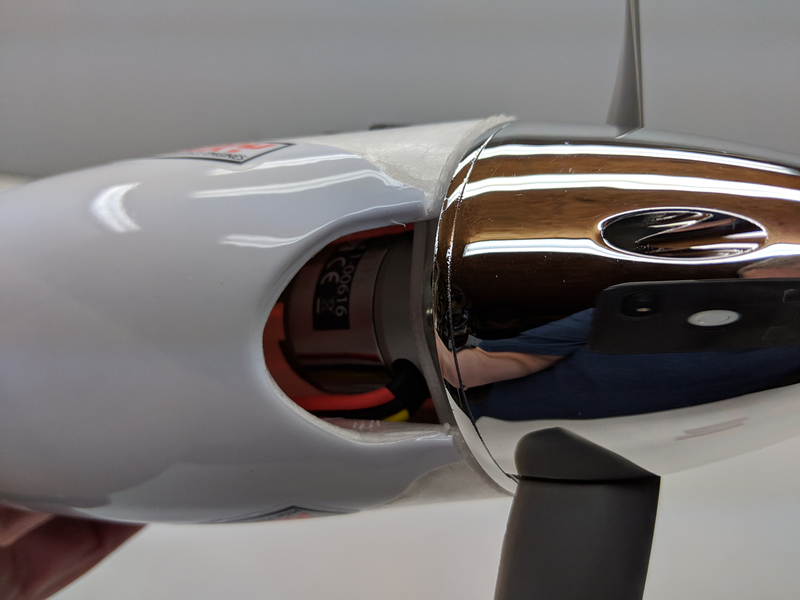 After a brief run-up of the motor, servo and control surface deflection check, the propeller and spinner were reinstalled. 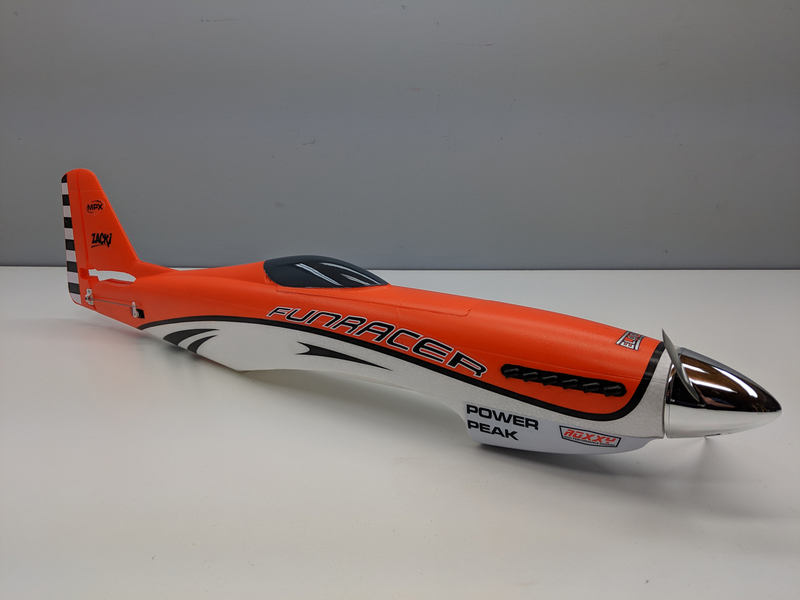 The FunRacer was nearly ready to fly! 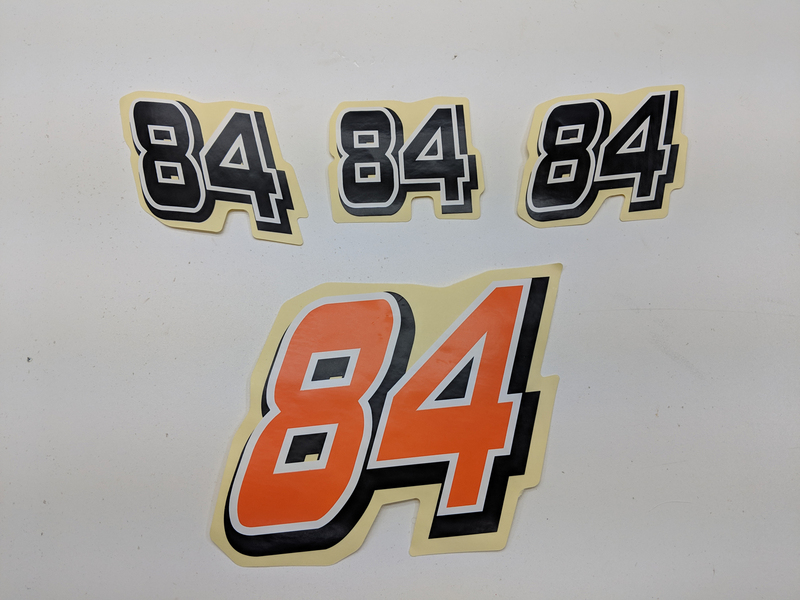 There’s a set of ‘racing number’ decals included as well. I decided to add them, as they looked pretty cool! 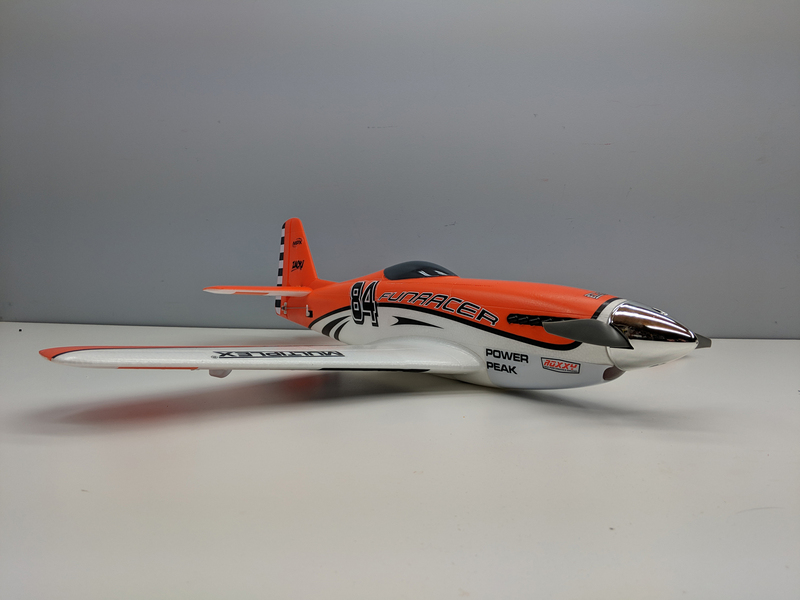 The decals applied easily, and really added to the racing look of the airframe! 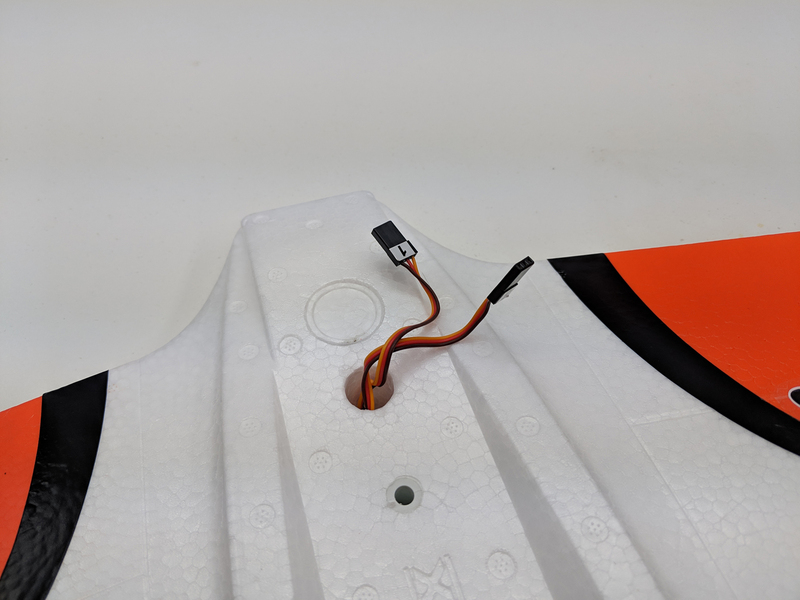 A quick check of the Center of Gravity (located at 18 mm behind the forward panel line molded into the top side of the wing) showed that there is ample room in the fuse for 3S and 4S batteries alike! 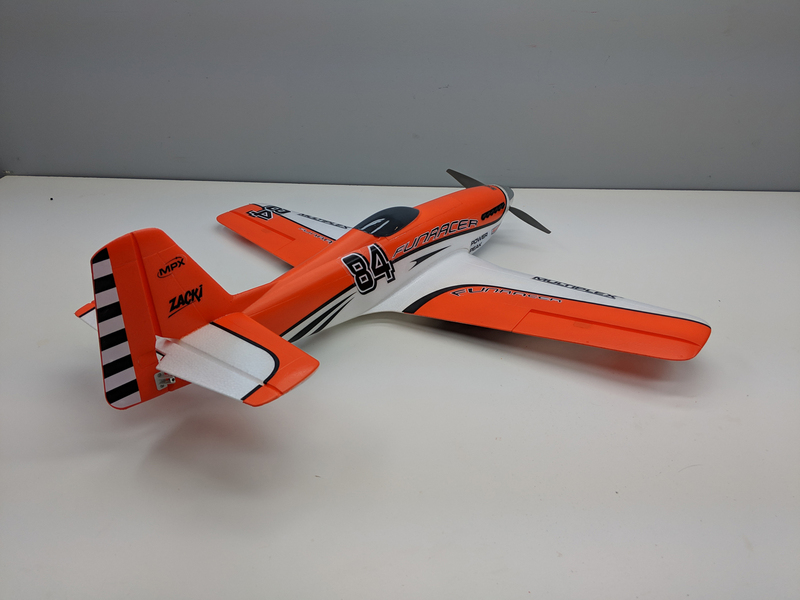 For initial testing, I think we’ll stick to the recommended 3S liPo. 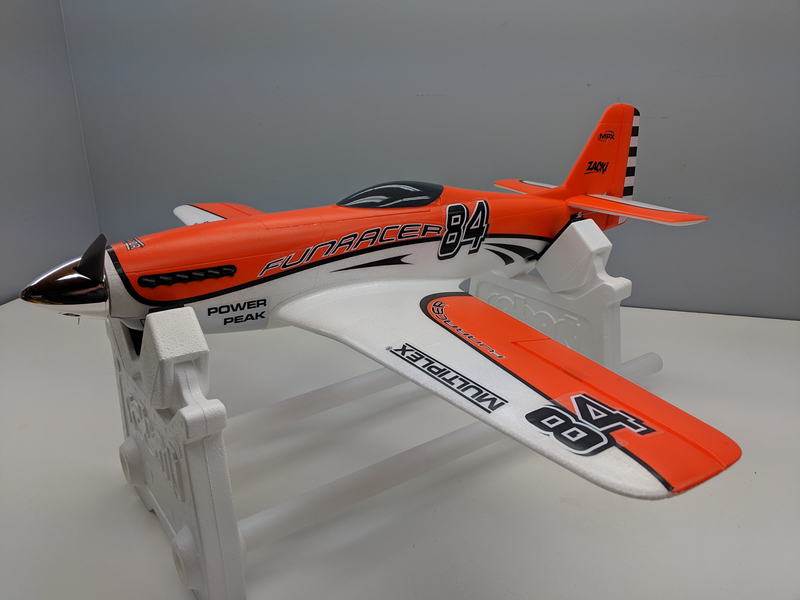 With that, the FunRacer was ready to fly – Now, if I can just melt the snow and find that darn flying field!!! 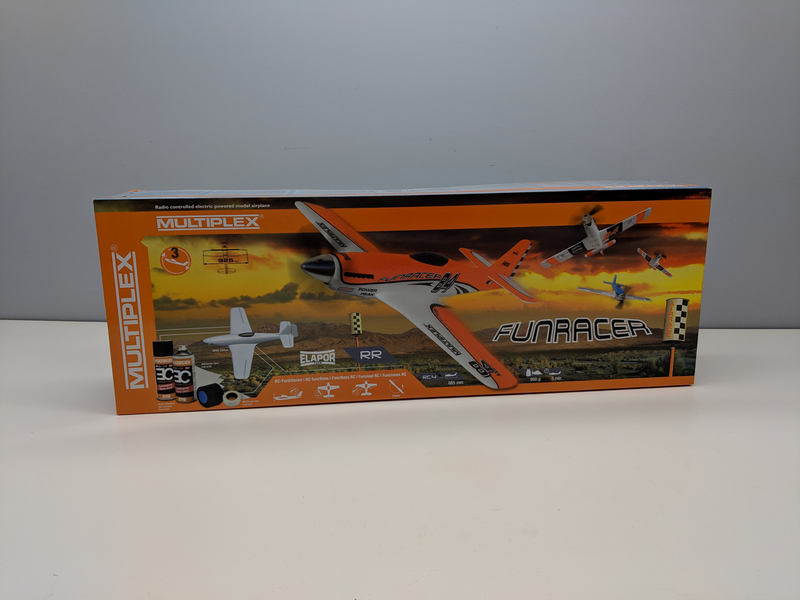 I really like the Multiplex FunRacer so far. 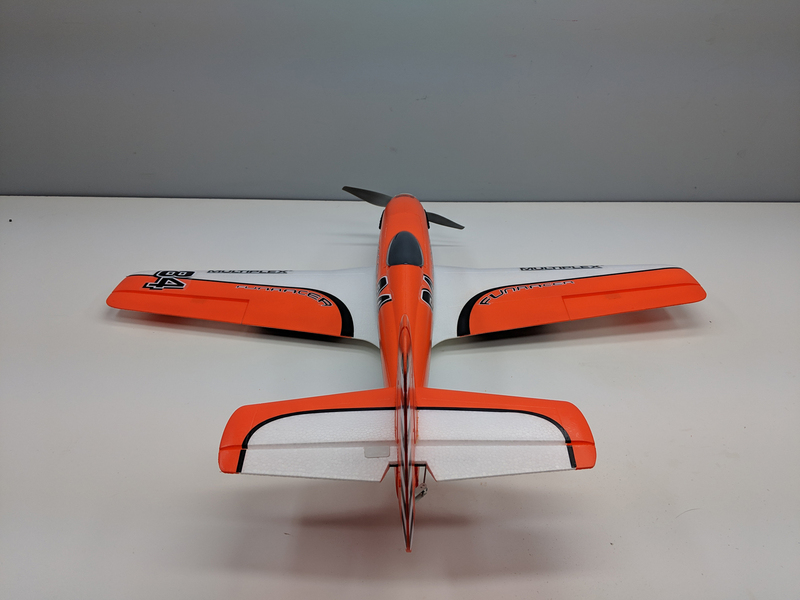 It looks great, assembled really easily, and comes with a host of great, pre-installed parts! 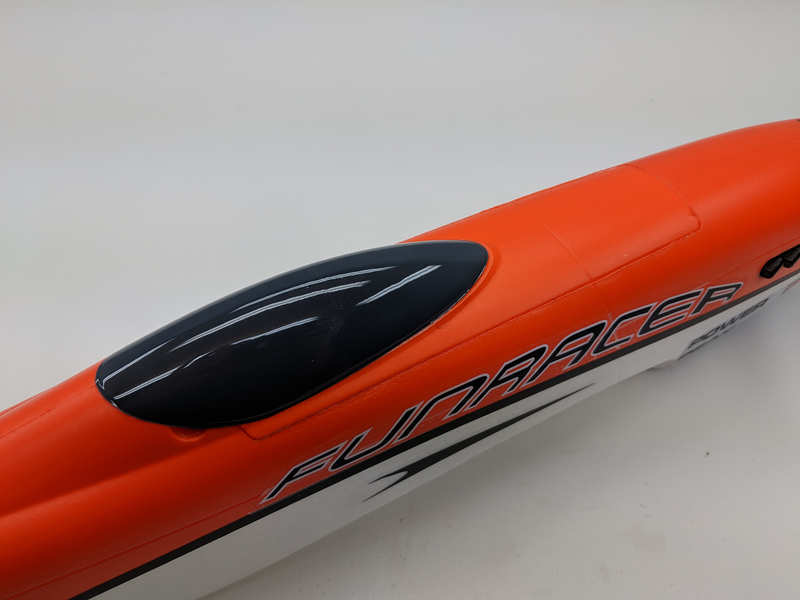 Flying the FunRacer on 3S LiPo batteries makes it affordable to buy batteries as well. 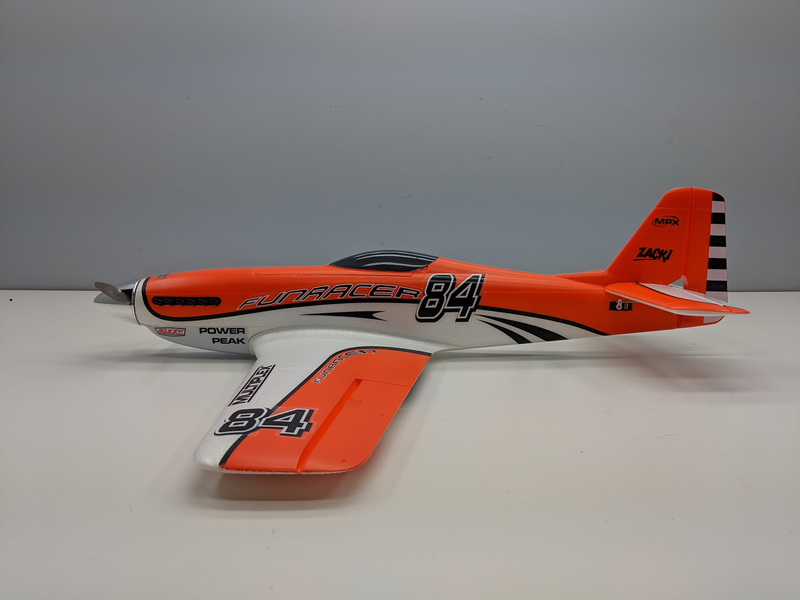 Most of us that fly electrics already have several 3S pack in our collection, meaning no additional batteries need to be purchased! 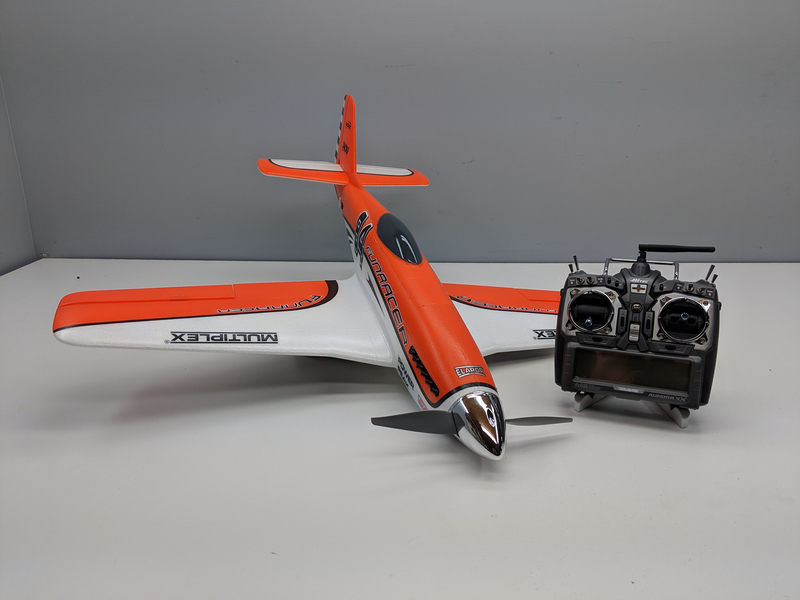 A simple 5 channel transmitter and receiver round out the requirements, making it an affordable airplane – especially when it’s priced at less that $200 dollars! 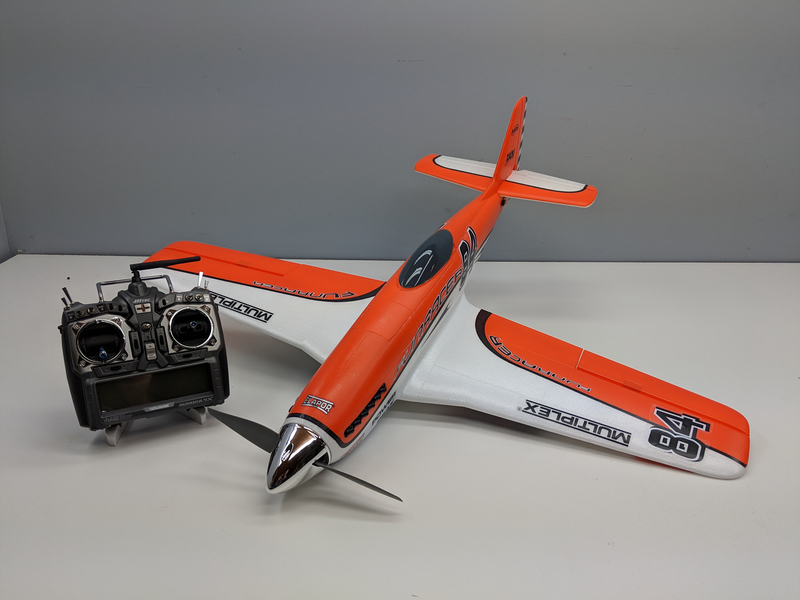 I’m excited to get this out and go flying – it looks like it’ll be a lot of fun!